2. It is like SLEEP: Job 14:12, Ps. 13:3, 17:15, Mt. 9:24, Jn. 11:11, 1Cor. 15:6, 18, 20, 51, 1Th. 4:13, 14,5:10, etc. 6. In Death there is NO MEMORY: Ps. 6:5, 88:12. 9. In Death there is NO SPEECH: Ps. 30:9, 8:10-11, Prov. 27:20. 10. Death is TOTAL DESTRUCTION: Ps. 55:23, 88:5-11. 11. Death for every child of Adam is CERTAIN: Ps. 22:29, Job 14:10, 21:13, Ecc. 9:5, Rom. 5:12, Heb. 9:27. (b) Unsaved: Ps. 9:17, 88:4, Ez. 32:18, Mt. 11:23, 23:33. (a) For Jesus, in his resurrection: Mt. 28:46, Acts 2:24-27, 31:33, 3:15, 26, 4:10, 5:30, 10:40, 13:30, 17:31, Rom. 10:9, Eph.1:20,2:5, Col 2:12, 1Th. 1:10. (b) For Mankind on Resurrection Day to Come: Ez. 37:3-12, Jn. 5:26-28, Eph. 2:6, 2Cor. 4:14, Rev. 20:12,21:1-7. 14. ON RESURRECTION DAY, God’s redeemed enter THE NEW HEAVEN & NEW EARTH prepared for them; while the Unredeemed face THE JUDGMENT & THE LAKE OF FIRE. No one “GOES TO HEAVEN” or “GOES TO HELL” when they die!! “Lost my wife, husband, child, father, mother, etc. “But almost never do we hear:”Asleep in Jesus”, or “Awaiting Resurrection Day”. Rom.6:23 Sin earns death, but God will give eternal life through Jesus Christ.The wages will come at Resurrection/Judgment Day; so then will the gift. Gen.7:1 “Man (i.e. the whole person) whom I have created …I will destroy,” said God, before the Ark was built. Jn 11:25 I, Jesus am the Source of future resurrection to life eternal. Jn 11:26 (Suggested full meaning implied by the context) The one believing in Me, though he dies, will live again (on Resurrection Day); and those believing in me, when they come to life on that Day,” will then never die again! (1) Wording from Nestle Greek text. (2) Nowhere in vss.12-20 is reference to “bodies”! 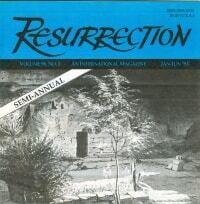 Vs.12: IF we preach that Christ was raised from among dead persons (Gk.ek nekron), how can some of you say there is no resurrection of dead persons? Vs.13: IF there is no resurrection of dead persons (Gk. nekron), neither has Christ been raised. Vs.14: IF Christ has not been raised, our preaching is vain and your faith is vain(Gk. kene = empty). Vs.15: IF dead persons (Gk. nekroi) are not raised, we are false witnesses of God. Vs.16: IF dead persons (Gk. nekroi) are not raised, neither has Christ been raised. Vs.17-18: IF Christ has not been raised, your faith is useless, you are still sin bound; and those fallen asleep (Gk. koimethentes) in Christ have perished (Gk. apolonto = been destroyed). Vs.19: IF in this life only we have hoped, we are more to be pitied than all men. Vs.20-23:BUT now Christ has been raised up from dead persons (Gk. ek nekron),the firstfruit of those fallen asleep (Gk. kekoimemenon). For since through a man (came) death, also through a man (came) resurrection of dead persons (Gk, nekron). For, as in Adam all die, so also in Christ all will be made alive. But each (person) in his own order; Christ the firstfruit; afterward, those that belong to Christ at his coming.